More and more Britons will be able to fly out on Middle Eastern holidays from Birmingham Airport, thanks to a giant of the aviation world. Emirates debuted the colossal Airbus A380 at the weekend. 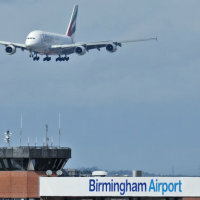 Sunday's (March 27) maiden Birmingham-Dubai flight attracted hundreds of plane spotters. So just how big is the A380? In a word: massive. Its length measures 238ft . That's 72.5m or 79.33 yards. It also weighs in at over 560 tonnes . This gives it a capacity of 615 passengers (557 economy plus 58 business-class flyers). No matter how big an aircraft is, nothing can guarantee against flights being delayed or even cancelled. This is why it is prudent to take out trusted travel insurance. Such cover means that travellers are not left out of pocket should their flight plans be disrupted. It also guards them against theft and loss of travel items and documents. The luxurious United Arab Emirates city of Dubai even dwarves the Airbus A380 when it comes to size. Its sci-fi-like Burj Khalifa is the daddy of all skyscrapers, standing at an unprecedented 829.8m (2,722ft) tall with 154 floors in use. The city attracts tourists for its upmarket shopping opportunities and fine dining. It is also dotted with water parks. The A380's new capacity will open up increased opportunities for Middle East-bound travellers. Emirates will be able to fly an extra 15% of British-departing passengers every day to the area. The Airbus supersedes the Boeing 777's lunchtime daily service out of Birmingham. Emirates now puts on 77 Middle Eastern trips for British tourists every day. The Birmingham travel hub has introduced a new extended runway to host the aircraft. It also poured £1 million into a fresh air bridge. This is allowing Airbus passengers to choose which side of the A380 they wish to alight from. Laurie Berryman, who is Emirates' UK vice-president, calls the latest development "very exciting". He says demand has increased in the Midlands area to fuel Emirates' growth since it started flying out of Birmingham in 2001.